Chinese dating scammers are in hot water this summer. More than a thousand members of fraud rings have been arrested in the country over the last two months, potentially saving thousands of singles from falling victim to their deceit. In June, police in the southern province of Guangdong cracked down on 13 gangs who posed as attractive women in order to con men into purchasing pricey products like tea and wine. Authorities apprehended a total of 1,310 suspects, each of whom could approach up to 1,500 victims per month. “These scam gangs [succeed] because they capture the psychology of many men: When facing beautiful women, men lose their judgement, and feel too shy to refuse,” a Guangdong police officer said at a briefing about the arrests. The gangs used WeChat’s ‘People Nearby’ function and photographs of models to lure victims into conversations. After months of chatting to establish trust, the scammers used fictional family tragedies to persuade targets to buy items like tea, wine, tobacco, alcohol, health products, or investments in precious metals through a platform controlled by the group. One group even used oil paintings to bait their targets. According to Guangzhou Daily, most of the con artists were millennials. Others were “middle-aged uncles who liked to pick at their feet.” Their scams had become so sophisticated that they had developed a 60-day formula for conning a new victim, and hired models to pose for photos and videos to establish more believable profiles. 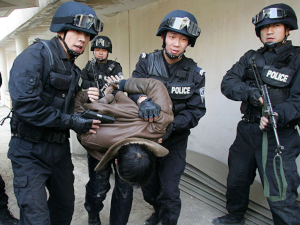 Fifty-seven more members of a fraud ring - many of whom are family members - were arrested this month in eastern China. The group got its start running a pyramid scheme, but switched to online romance fraud in 2015 to make more money. Like the gangs arrested previously, members of this ring posed as young single women to scam men looking for love online. One perpetrator confessed to using a variety of fake profiles to target victims and boasted of his success in swindling “difficult targets.” Another revealed that one of his targets became suspicious and contacted authorities, a call that triggered the investigation that eventually broke the gang. A court in Suqian, Jiangsu province, found the group guilty of committing more than 140 cases of fraud involving more than 1 million yuan (US$146,700). They were sentenced to between six months and 11 years in prison, and fined between 200,000 and 30 million yuan. The court said the case involved the largest number of victims and defendants it had handled in recent years. I am surprised at how little over sight is placed on to dating apps. They have no accountability and their security measures are laughable. I know 14 year olds that could do a better job. First and foremost they should not be able to inflate their numbers by leaving inactive or a lot of times completely dead accounts on their sites. They full well know what they are doing. And in any business they would be arrested for fraud. There are lots of outside scammers like presented above, but the worst scammers are the companies themselves like Match and their other sites such as PoF, Tinder, and OKCupid. Id like to see a crack down on the companies themselves.